is in fact Roberts first wife. adding more proof that Robert Sweet's first wife was Edith Pliney Gilmore. in the book), both born in Tenn.  Interment Union Chapel Cemetery. John Gillmore is Edith’s brother. 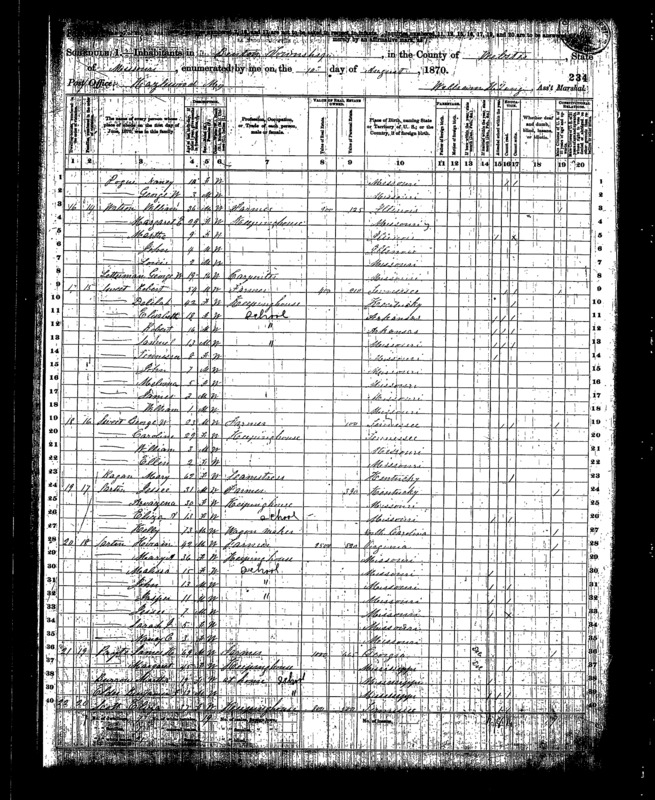 Edith is listed as Edy in the census. Delilah Bookout living with an Anne Bookout. Delilah finally shows up being married to Robert Sweet. Sarah, Elizabeth, Robert and Samuel Sweet. the correct information out there. and died 1896 in Fordland, Webster County, Missouri. Carolina, and died 1861 in Seymour, Webster County, Missouri. Tennessee; d. 16 March 1914, Christian County, Missouri, Benton Township. Benton Township, Christian County, Missouri. d. 1906, Douglas County, Missouri. Tennessee; d. 13 December 1934.
vi. ELIZABETH F. SWEET, b. 1853. 6.	vii. ROBERT M. SWEET, b. 1854, Arkansas. 7.	viii. SAMUEL C. SWEET, b. 1857, Missouri. Fordland, Webster County, Missouri; d. 16 April 1894.
x.	JOHN SWEET, b. 1863.
xi. MALISSA SWEET, b. 1865.
xii. JAMES SWEET, b. 1867.
xiii. WILLIAM SWEET, b. 1869.
and died 16 March 1914 in Christian County, Missouri, Benton Township. Missouri, son of JOSEPH BOOKOUT. He was born 1843 in Tennessee, and died 1923.
i.	HARVEY SYLVESTER3 BOOKOUT, b. 08 November 1877.
ii. NANCY E. BOOKOUT, b. 1863.
iii. MARY J. BOOKOUT, b. 1864.
iv. SARAH A. BOOKOUT, b. 1865.
v.	JOSEPH G. BOOKOUT, b. 1867.
vi. CLARISSA BOOKOUT, b. 1873.
vii. JULIA BOOKOUT, b. 1879.
and died 1898 in Benton Township, Christian County, Missouri. in Christian County, Missouri, Benton Township. i.	MALINDA3 SWEARENGIN, b. 1868.
d. 30 January 1903, Ozark County Missouri. iii. SARAH SWEARENGIN, b. 1872.
iv. EMALINE SWEARENGIN, b. 1874. 10.	v.	GEORGE SWEARENGIN, b. 06 January 1876; d. 16 July 1952.
vi. CYNTHIA SWEARENGIN, b. 1878.
m. CLARA M. BRAZEAL, 16 November 1902; b. 17 August 1883; d. 17 May 1979. 14 April 1864 in Webster County, Missouri, son of JAMES BOOKOUT. He was born 30 November 1843, and died 28 March 1907 in Douglas County, Missouri. i.	JAMES3 BOOKOUT, b. 1865.
ii. SARAH BOOKOUT, b. 1866.
iii. NANCY BOOKOUT, b. 1868.
iv. JESSE BOOKOUT, b. 1871.
v.	WILLIAM BOOKOUT, b. 1873.
vi. FRANCIS M. BOOKOUT, b. October 1875.
vii. ISABELL BOOKOUT, b. 1877.
viii. JOHN T. BOOKOUT, b. May 1883.
ix. MARGARET R. BOOKOUT, b. June 1888. MARY BOOKOUT. She was born 1841 in Tennessee, and died 29 January 1911. 11.	i.	WILLIAM M.3 SWEET, b. January 1867, Missouri. ii. NANCY E. SWEET, b. 1868.
iii. JAMES H. SWEET, b. 1881.
iv. SIDNEY C. SWEET, b. 1871.
v.	MAY E. SWEET, b. 1874. 6. 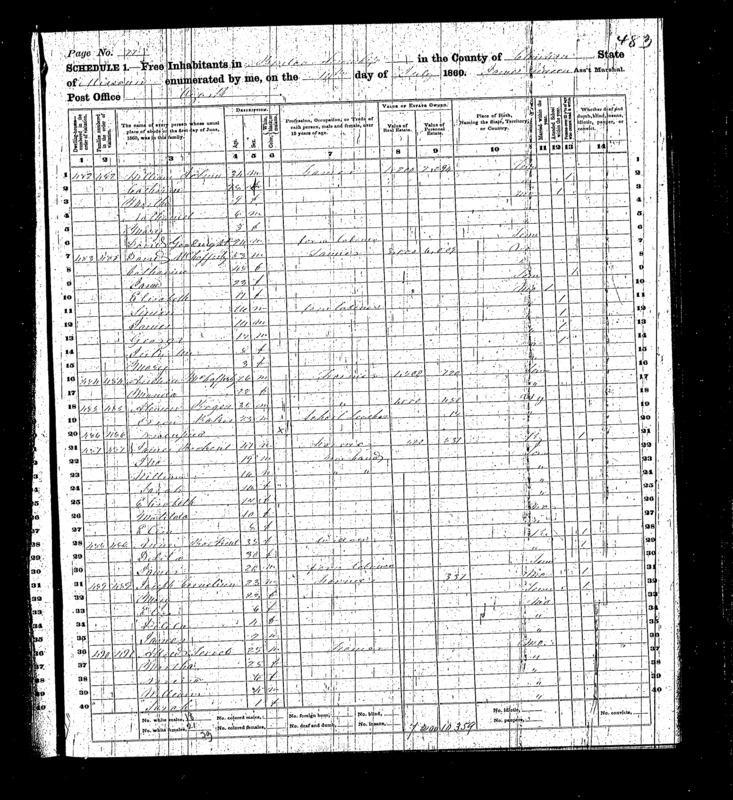 ROBERT M.2 SWEET (ROBERT1) was born 1854 in Arkansas. He married MARY JANE. She was born 1858.
i.	GEORGE WASHINGTON3 SWEET, b. 1876.
ii. SAMUEL W. SWEET, b. 1877.
iii. NANCY M. SWEET, b. February 1880. 7. SAMUEL C.2 SWEET (ROBERT1) was born 1857 in Missouri. in Christian County, Missouri, daughter of J PARNELL and S. E..
She was born 30 August 1868, and died 13 December 1899.
i.	JAMES A.3 SWEET, b. 1878.
ii. ROBERT K. SWEET, b. 1880. 1880 in Fordland, Webster County, Missouri. He was born July 1852.
i.	JULIA M.3 WELLS, b. March 1882.
ii. JAMES M. WELLS, b. March 1885.
iii. EDGAR T. WELLS, b. September 1887.
iv. OTTO H. WELLS, b. December 1890.
v.	WALTER L. WELLS, b. July 1893.
and died 14 April 1932 in Oklahoma. 12.	i.	LULA4 WITT, b. 24 March 1888, Missouri; d. July 1977, Ava, Missouri. 13.	ii. JAMES WITT, b. 1890, Arkansas. and died 16 July 1952. He married NANCY BOOKOUT 30 June 1895. She was born 02 September 1875, and died 05 June 1972.
i.	INFANT4 SWEARENGIN, b. 28 December 1905.
ii. INFANT SWEARENGIN, b. 27 February 1904. 11. 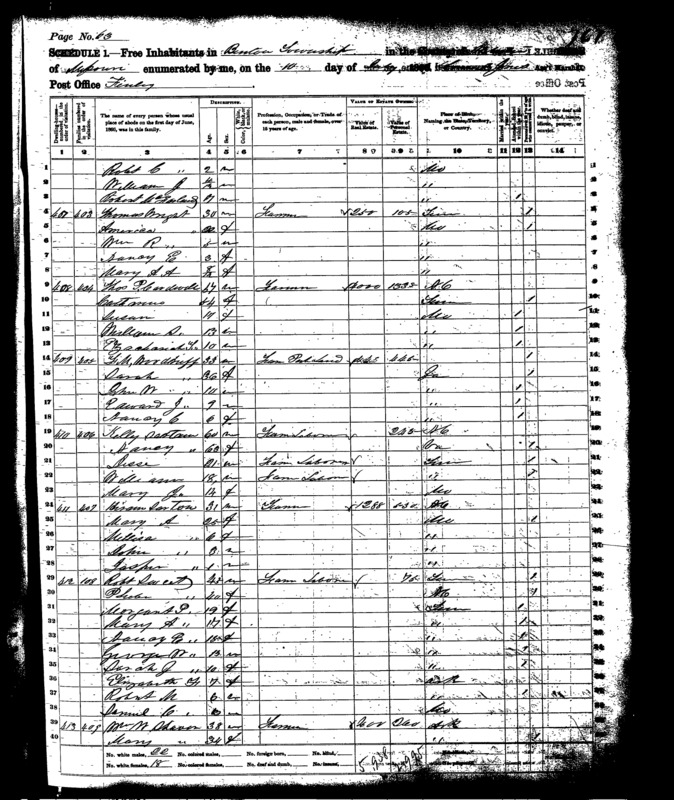 WILLIAM M.3 SWEET (GEORGE W.2, ROBERT1) was born January 1867 in Missouri. He married SARAH D. 1892. She was born September 1870 in Tennessee. i.	GEORGE R.4 SWEET, b. May 1894.
ii. EARNEST S. SWEET, b. May 1900.
was born 24 March 1888 in Missouri, and died July 1977 in Ava, Missouri. Pond Creek Township, Greene County Missouri, and died August 1981 in Ava, Missouri. i.	EDITH5 OWENS, b. 22 October 1907; m. W. B. REYNOLDS, 09 May 1927.
ii. 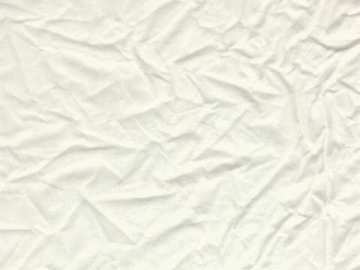 JEWEL OWENS, b. 12 March 1910; m. A. K. REYNOLDS, 23 December 1927.
iii. MARIE OWENS, b. 17 April 1913; m. J. V. SWEARENGIN, 13 July 1946. Missouri; d. 22 November 2004, Springfield, Missouri. was born 1890 in Arkansas. He married CARA. She was born 1898.
i.	ALMA5 WITT, b. 1915. 22 November 2004 in Springfield, Missouri. Ozark County Missouri, and died 09 December 2000 in Springfield, Missouri. Fred Luther Owens, 86, went to meet his Savior on Monday, Nov. 22, 2004. He was born Jan. 24, 1918, in Gainesville, Mo., the son of Charles and Lula Owens. children and a pillar of strength to his brother and sisters. He enjoyed sharing his faith and stories of his grandchildren with others. and his daughter Patricia, Springfield; nine grandchildren; and ten great-grandchildren. noon. Donations to the Center Point Cemetery in Gainesville are appreciated. i.	PATRICIA6 OWENS, b. 1971. 15.	ii. DOYLE FRED6 OWENS, b. 1938. 16.	iii. JERRY EDWARD OWENS, b. 1944, Ozark County, Missouri. 17.	iv. JAMES MERLE OWENS, b. 1946. MARY ANN2 SWEET, ROBERT1) was born  1938. He married KATHERINE SUE WILBANKS  1959. She was born  1941.
i.	JEFFERY DOYLE7 OWENS, b. 1961. MARY ANN2 SWEET, ROBERT1) was born  1944 in Ozark County, Missouri. 18.	i.	JENNIFER ELIZABETH7 OWENS, b. 1966. 19.	ii. JANE ERIN OWENS, b. 1970, Kansas City, Kansas. KAREN FAYE HARRISON  1965. She was born  1948.
i.	SUZANNE7 OWENS, b. 1965. EDITH3 SWEARENGIN, MARY ANN2 SWEET, ROBERT1) was born  1966. She married MICHAEL LAYNE KEEL  1987.
i.	HAILEY ELIZABETH8 KEEL, b. 1990.
ii. JEREMY LAYNE KEEL, b. 1992.